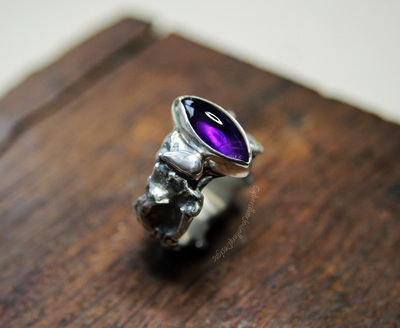 An absolutely stunning amethyst set in a one-of-a-kind statement ring. 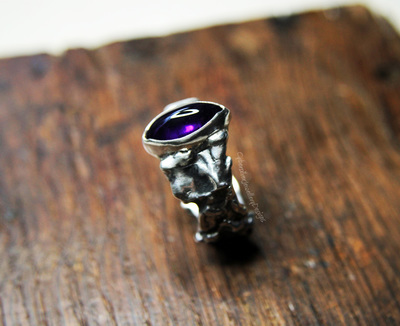 This amazing ring has been created using the silversmithing technique of fusing. I love this technique - you can never predict the outcome but it can create amazing organic shapes. This ring is really substantial and has a lovely organic, natural feel to it which is complimented by the perfectly purple amethyst. The depth of colour in this stone is fantastic. The silver has been oxidised, polished and then finished with a layer of protective microcrystalline wax. ​Delivery - To ensure you receive your ring promptly and safely, I post UK Special Delivery or International Tracked and Signed. These are tracked, insured and signed-for services. 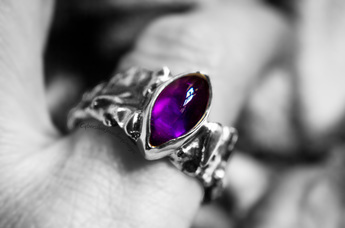 ​Please refer to our ring sizing guide and terms and conditions before placing your order.